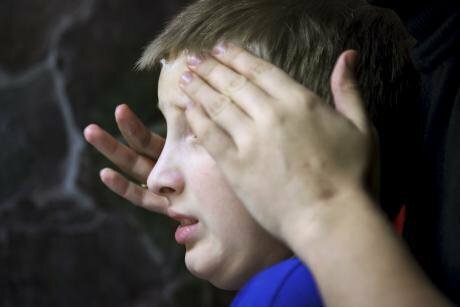 An autistic boy reacts to a touch during a massage. Photo: Natasha Kharlamova / Flickr. 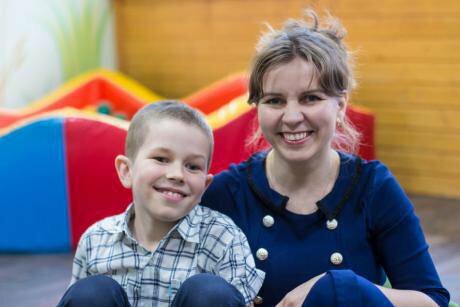 All rights reserved.Six years ago, Petrozavodsk resident Natalya Nikulina found herself in the following situation: her son Stepan was diagnosed with autism at the age of three. When he was four, Natalya opened a playroom for children, like him, on the autistic spectrum. I asked her how she did it – and how Karelia’s only studio for children with special needs works today. – Hi. I’m Anya. How are things? This conversation wasn’t the first I had with Styopa Nikulin. We have the same one several times a year, after which he slips back into his own world. This nine-year-old with his big grey eyes surprises me every time with his new discoveries: he might be learning to count in English, draw amazing pictures or show me a cartoon film based on them. Stepan was diagnosed with autism when he was nearly three. Natalya, his mother, was initially depressed and emotionally exhausted, but then she thought of a way to help him. Styopa was her third child, and before he was born she was a civic activist engaged in raising public awareness of human rights. When she realised that she couldn’t count on any help for her son from the state, she took the initiative herself. That’s how the “Let’s Create Together” studio appeared in Petrozavodsk. Now Natalya Nikulina’s studio occupies several rooms in a children and young people’s centre: a play room with developmental materials, a creative corner for art therapy sessions, a kitchen for cookery master classes: there is even a summer garden with a large glasshouse. A recent innovation has been a “tactile” room with a hammock and developmental materials which you can touch and investigate their texture. “Soon we’ll take up the entire floor,” laughs Natalya. Five years ago, it all started with a small room that Nikulina was able to refurbish and equip thanks to a grant from Karelia’s Health Ministry, and buy some child developmental publications as well. The parents of other autistic children couldn’t believe that a place where their children could play without being stared at had opened in Petrozavodsk. Not to mention the fact that the parents could share their experience of bringing up disabled children. “At that point there was nowhere in the republic with an ongoing developmental programme for families where there was a child with autism,” Natalya recalls. According to Natalya, getting a diagnosis of autism is a long process, especially in Russia’s regions. Parents and children usually progress through several stages: a speech and language therapy group at nursery school, a class for children with developmental delay and numerous tests, followed by the discouraging diagnosis of autism. Only then are parents invited to a ten part course at a psycho-neurological centre, after which any help from the state comes to a dead end and stark reality, which you have to deal with yourself, begins. All parents bringing up children with autism go through the same experience, as did Natalya – except she decided that in the future she would choose her own path. In 2013, Natalya managed to set up an association of parents who, like her, wanted not only to help their children develop, but to learn how to live with the condition themselves. Natalya looked for specialist therapists who would like to work with children with autism: seminars were organised and developmental programmes created with the help of the most tenacious. Over the past five years, the “Let’s Create Together” studio has seen children drawing, cutting and pasting, modelling clay, sowing seeds, cooking, playing musical instruments and even bells, as well as rock-climbing and going away to summer camps. Elena Rogozina, an art therapist, is one of the teachers who has found kindred spirits at the studio, partly because she finds it easy to get along with children. Elena is now studying to be a psychologist, investigating remedial techniques, periodically going to conferences and seminars where speakers explain how to work with children on the autistic spectrum. The main key to success, she says, is to learn to accept these children as they are. Elena Rogozina, an art therapist. Photo courtesy of the author. All rights reserved.According to Rogozina, no one is forced to do anything at her sessions: if you don’t feel like working with clay, you can draw or dance. It’s important for a child to express their emotions, but respect the emotions and feelings of others at the same time. And typically developing children, who also come to the sessions, can help with this. This is why every new project, and indeed the studio itself, has the word “together” in its name. Fifteen families are now taking an active role in the life of the studio – they are the core group who regularly come to sessions with their children and take part in planning the studio’s further development. And there are another 15 or so who just bring their children to sessions. As well as the children’s programmes, the studio periodically runs courses for adults. This year it's specialists attended a course at the “Naked Hearts” charitable foundation and now they will pass on their newly acquired knowledge about autism and early years work with disabled children to parents. One example of this is an alternative communication system for children with speech impairments, based on cards that the person with autism can use to communicate with other people. At the beginning of this year, Natalya met the American creators of this type of alternative communication on their first trip to Russia, and the visitors agreed to revise the Petrozavodsk teachers’ materials, to bring their quality up to scratch. The studio also received a 1.2m rouble grant from the “Towards Change” Foundation to develop its own alternative communication course, which will include a video lesson with children, where the tutor will show the studio’s staff and parents how to introduce cards into their lives. According to officials responding to a press query about services for children with autism in Karelia, the “Let’s Create Together” studio has, in its five years of existence, had grants totalling 1.45m rouble (£16,616) from Karelia’s Ministry of Social Services. The republic’s Ministry of Education also gave a terse response to a question about the studio and its importance as a focal point for family support: there are 78 children with an autistic spectrum disorder in Karelian schools. And the support these children receive corresponds to “the regulations governing federal state educational standards for pre-school and mainstream education”. 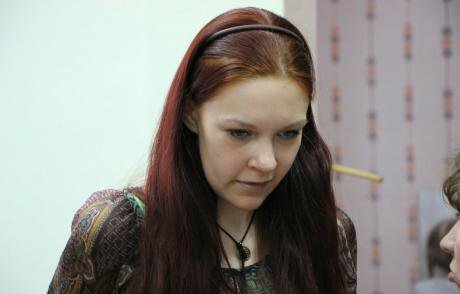 Natalya Nikulina told me about her son’s education. Stepan goes to an ordinary city school, where he has his own individual learning plan. He is integrated into his class as much as possible, but if he’s not in the mood he works one-to-one with a teacher. This year, Styopa’s teacher was on maternity leave, and Natalya panicked: any change in a child with autism’s situation can have an effect on their psychological stability. But Natalya succeeded in persuading the school to provide a stand-in for him. Natalya recently raised the question with Karelia’s Ministry of Education of adopting the American practice of setting up a special class, with extra resources, for children with autism in nursery and primary schools, on the assumption that these improved facilities will lead to the children learning more quickly and gradually being integrated into mainstream. According to Natalya, children in the US are diagnosed before the age of one and a half and the system immediately gears up. The US experience has also shown that the more the state invests in the development of children with autism in their early years, the less it will have to pay to support them in adulthood, as they become capable of living independently. In Russia, however, there is no funding allocated for such a programme. Meanwhile, Natalya does what she can to help the “Let’s Create Together” studio develop within existing conditions. The last time she had to refurbish an office as a tactile room, she bought the paint and plaster herself. Sometimes donors come up with something to help: at the end of last year, a Finnish company ordered cards with drawings by the children. So the staff at this Finnish firm got original Christmas cards from their management, and the studio in Petrozavodsk got a new cupboard for its activity materials.